The beautiful Elsa Brändström Haus, also called "The White House", is situated on the hills along the Elbe River and has been the long-standing, traditional home of the iARS meetings. The EBH has served as an international educational centre and conference venue for more than 40 years. The impressive villa overlooking the river dates back to the end of the 19th century. 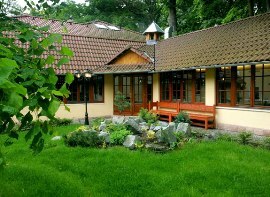 Together with the neighbouring "Gästehaus" (guest house), it offers seminar guests a tranquil, work-friendly atmosphere in which to fully concentrate on their topics in a relaxing surrounding. Namesake of the EBH was Swedish Red Cross nurse Elsa Brändström, who, after World War I, took care of German POWs, many of whom owed their lives to her. During World War II, she supported numerous emigrants of the Hitler regime in the USA, where she died in 1948. In remembrance and honour of her outstanding personality and achievements, the "Elsa Brändström Haus Society", founded in 1950, was named after her. Educational work has been a key priority since then, and the White House has served as an international conference venue since 1972. The lovely Hotel Nosál, located in a picturesque woodland only a short distance away from the city center of Prague at the edge of one of the city's biggest parks, has hosted the iARS meetings held in Prague since 2011. The family-run hotel, with more than a century of tradition, offers an undisturbed atmosphere in which it is easy to fully concentrate on scientific questions and intensive networking between the participants and also with the teachers. The beautiful, cultivated garden invites to extend peer-to-peer discussions even after the sessions in the open air. The friendly staff provides a homely atmosphere, and the scenically beautful surrounding woodlands allow room for some relaxation after a day full of lectures and discussions to recharge the batteries for the next day ahead.